Right-click the “Command Prompt” item, and select “Run as administrator”. and then press ENTER, where sourcepath is the source path for the files to be copied, and destinationpath is the destination path for the files. I had weird problems until I did this. Make sure you get the newest drivers. Set disk space usage to around 1.5 GB. Move the Taskbar to the left side of the screen. With a widescreen monitor (which any new computer will have), it makes much more sense to waste a small strip on the left than a strip that runs all the way across the bottom of the screen, making a narrow display area even narrower. This is a small drop-down arrow at the top of Windows Explorer. Click “View” button on the Ribbon, click the “Options” button, and select “Change folder and search options”. I am only noting changes from the default settings. The settings below are only the changes from the default. It lets you group pinned icons on the Windows 10 taskbar. It’s an open source Windows shell extension allowing you to see thumbnails of Photoshop files. Despite the changes I made above, I still found the default Windows File Explorer frustrating. I tried a number of alternate file managers, including Explorer++, FreeCommander, and XYplorer. Q-Dir met my needs better than anything else I tried. Then go down the list and laboriously change each individual extension one by one. I am putting this here in case someone else has the same problem. The network adapter in my laptop kept disconnecting (not all the time — once a day, generally). I could not figure out why. These links helped me solve the problem. Where is the horizontal scrollbar in the left (navigation) pane? This annoys me no end. If you are installing Windows 7, or if you just got a new computer, there are a few things you should do before you start using it. Here they are. Right-click the Windows logo on the taskbar. On the “Start Menu” tab, click the “Customize” button. Computer: display as a menu. Control panel: display as a menu. Devices and printers: not checked. Documents: display as a menu. Downloads: do not display this item. Games: do not display this item. Highlight newly installed programs: not checked. Music: display as a menu. Personal folder: do not display this item. Pictures: display as a menu. Recorded TV: do not display this item. Search other files: search with public folders. Sort All programs menu: checked. System administrative tools: Don’t display this item. Videos: Display as a menu. Make your local network a Work network (or just hide Homegroup). 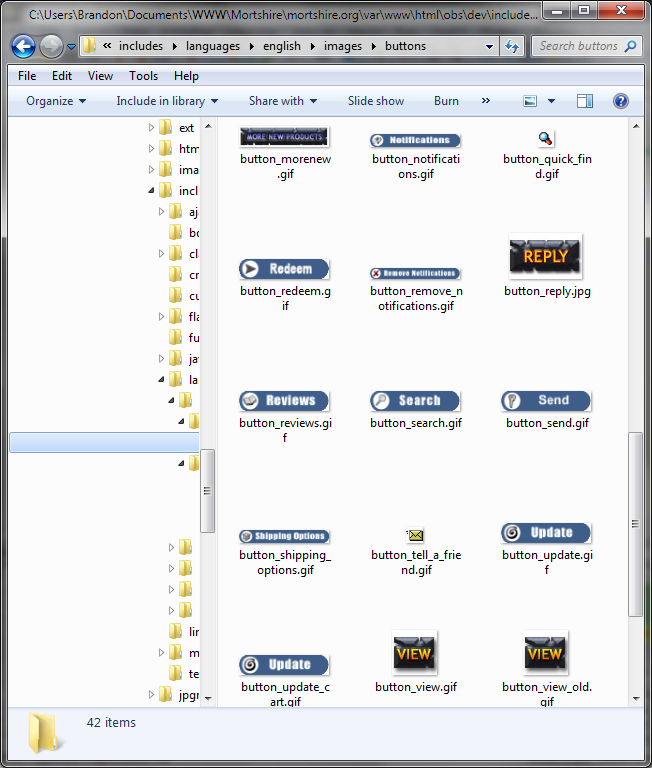 Open Windows Explorer, click the “Organize” button, and select “Folder and Search options”. Always show icons: not checked. Display the full path: checked. Hidden files and folders: Don’t show (we will do something about this further down). Hide empty drives: not checked. Hide extensions: not checked (this is the most idiotic option ever). Hide protected OS files: not checked. Launch folder windows in a separate process: not checked. Use check boxes to select: not checked. When typing into list view: Select the typed item. Click the “Apply To Folders” button, and click OK. In Windows Explorer, navigate to “C:\Users\[your user name]”. Right-click “My Documents”, and rename it to “Documents”. Right-click “My Music”, and rename it to “Music”. Right-click “My Pictures”, and rename it to “Images”. Right-click “My Videos”, and rename it to “Videos”. Drag and drop “Music” into the “Documents” folder. Drag and drop “Pictures” into the “Documents” folder. Drag and drop “Videos” into the “Documents” folder. Drag and drop “Downloads” into the “Documents” folder. Install Toggle Hidden Files and assign a hotkey to it (I use “Windows+h”). Show drive letters before the drive name. Install KeyTweak and remap the Caps Lock key to Left Shift. Add a Take Ownership context menu to Windows Explorer. Install AllSnap (the 64 bit version, if you are running 64-bit Windows). You must disable “Aero Snap” (which is useless) first! Remove the user folder from the Explorer navigation pane. FontExpert (It costs money, but if you work with fonts a great deal, it is worth it.) When you put fonts into groups, make sure you create shortcuts, rather than copying the font files. The Free Software Foundation has a new educational campaign, and in a shift from previous efforts, it is more openly negative about the costs and morality (or lack thereof) of closed-source software. 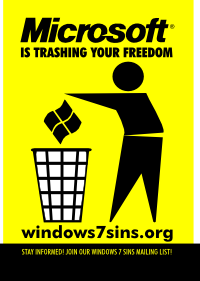 This is the Windows 7 Sins campaign, and it looks like the mainstream media might actually be picking up on it (if only to heckle). Personally, I think this is an interesting effort, and I hope that it achieves positive results. I define “positive results” as an increase in the number of people who convert to Linux (what the FSF stubbornly persists in calling “GNU/Linux”), and a decrease in the number of people who continue to blindly hand Microsoft their money.